The sports market is generating massive revenues worldwide with growth reportedly growing faster than overall GDP. The Europe, Middle East and Africa market is currently ranked the second largest sports market in the world with sponsorship identified as one of the fastest growing segments. The Middle East is very much considered to be the prime emerging sports market and continues to grow and offer scope for development. This potential across the region and specifically in the United Arab Emirates brings vast opportunities and challenges and will most certainly act as a catalyst for sustainable development. This development will require a parallel development in the legal infrastructure related to sports. Therefore this article will provide brief summary on the development of sports law in the UAE. 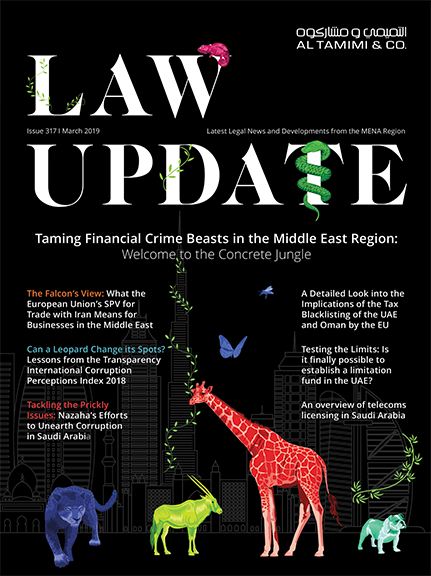 The UAE is a young jurisdiction but is maturing fast in the field of sports law and dispute resolution. Significant developments have occurred in the past decade. Several sports in the UAE have progressed from amateur to the professional level and as a result, now follow the rules of international sports governing bodies. Football is a good example that demonstrates how sport has progressed in the UAE.. It should also be noted that the commercial value of UAE Football leagues increases every year which highlights the importance of sport in the UAE. One of the most established sports associations in the UAE is the UAE Football Association. The UAE Football Association (the governing body of football in the UAE) was established pursuant to Ministerial Resolution No. 17 of 1972. This Resolution lists the 15 members of the Association, including the Chairman, his Deputy and the General Secretary. The legal authority of the Ministry of Youth and Sport is derived from two statutes: Law No. 1 of 1972 concerning the ministries’ authorities and Law No. 12 of 1972 regulating the clubs and associations working in the field of youth care. The members of the UAE Football Association have also issued the Statute of the UAE Football Association. This Statute is considered to be the main legislation regulating football in the UAE. In addition to football, the UAE boasts an impressive list of sports events and international sporting competitions. Abu Dhabi, the capital of the UAE, annually hosts the Formula One Grand Prix. Dubai hosts the most expensive horse race in the world (the Dubai World Cup) and is bidding to host the 2020 Olympic Games as well as world class golf, tennis, swimming, and rugby tournaments. The UAE Football Association is very active in hosting several competitions. Abu Dhabi Sports Council and the Dubai Sports Council are also very active in hosting international sports events. With regards to sports dispute resolution, the UAE Football Association have established a number of sports dispute resolution bodies. The UAE Football Association was influenced by the FIFA dispute resolution model because it is the global governing body of association football. In addition to the football dispute resolution bodies, another dispute resolution body that was recently established in the UAE is the Court of Arbitration for Sports (CAS)’ Alternate Hearing Centre in Abu Dhabi. The CAS has proven to be particularly popular as a dispute resolution mechanism for resolving disputes involving international sports. The “Emirates Sports Arbitration Centre” is also expected to be established in the near future. The law that will establish this centre is still in the draft stage. . The idea behind establishing the Emirates Sports Arbitration Centre is to create a national model of CAS for all the sports disputes in the country. The new CAS Centre and the establishment of other sports dispute resolution bodies are significant because of the prevalence of arbitration clauses in the rules and regulations of sports governing bodies. In view of these developments, the law relating to sport in the UAE will no doubt continue to grow and improve as the UAE continues to attract international sporting competitions in the future.